Orvelina Melendez witnessed her husband’s murder. Now on US-bound caravan, she hopes to provide for family, sick son. Work is suspended on a statue of Gandhi in Malawi, after campaigners argue he used racial slurs. The agency says there will be cloudy and sunny, hot dry weather conditions with chances of thunderstorms over most parts of the country. The post What weather will look like on Thursday – NiMet appeared first on Premium Times Nigeria. The government says N3,000 grant would be given monthly to all pregnant women for their transport to hospitals and clinics. The post 1000 pregnant women get grants for free ante-natal care in Bayelsa appeared first on Premium Times Nigeria. The board says the examination will enable them practice in Nigeria. The post JAMB conducts professional exam for 903 foreign medical, dental graduates appeared first on Premium Times Nigeria. The former Lagos governor also speaks on the crises in the APC. The post 2019: Tinubu speaks on Atiku’s chance, Oshiomhole’s fate as APC chairman appeared first on Premium Times Nigeria. Three children of Kate’s great-grandfather were killed during the war. The post UK’s Duchess, Kate, sees letters of relatives killed in World War 1 appeared first on Premium Times Nigeria. An American model, Angela Renèe, popularly known as Blac Chyna, is set to visit Nigeria for a pool party in November. In a post on her Instagram page on Wednesday, the mother of one who was formerly married to Rob Kardashian, a brother to reality TV star, Kim Kardashian described Nigeria as “motherland”. Alongside a flyer of the event, she wrote ““Hello Nigeria, I am visiting the motherland finally to party with the playnetworkafr in Abuja. Shout out to Charlesofplay and hit him up for invites”. Confirming her visit, Arafat Balogun, the manager of Play Network Africa revealed that the deal cost $30,000 aside travel plans and accommodation. Speaking with NAN, she said the model would be in Abuja for the party. She said: “A deal in the excess of N10 million has been agreed, excluding travel plans and accommodation. It is going to be a private event at an undisclosed location. Black Chyna began stripping to pay for her college tuition, but dropped out after falling asleep in class severally due to the nature of her work. 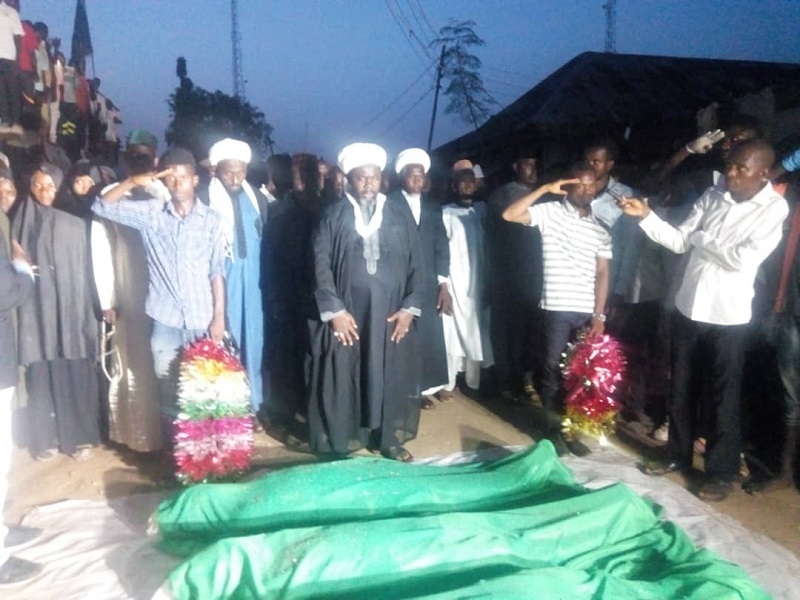 The Islamic Movement in Nigeria (IMN) has accused the Nigerian Army and the Nigeria Police Force of killing 46 of their members. The group also said 107 members sustained injuries, while 1,000 members were still missing after a clash with security operatives during the three-day religious gathering tagged: ‘Arbaeen Symbolic Trek’ in Abuja. The statement read: “The public will recall that on Saturday, 27 October, 2018 the followers of Sheikh Ibraheem Zakzaky (H) publicly announced the commencement of three (3) days religious gathering (Arbaeen Symbolic Trek) and protest for unconditional release of our leader, Sheikh Zakzaky (H). Unfortunately, during the programme, the Military and Police killed 46 mourners and protesters, injured 107 and 1,000 got missing. The worst part of the crime, the Police are now blackmailing us to cover their atrocities. He also noted that the struggle to demand for justice and unconditional release of their spiritual leader, Sheikh Ibraheem Zakzaky. Members of National Air Traffic Communicators Association of Nigeria (NACAN) have cried out over non-functional radio equipment in some stations and airports across the country. Speaking in an interview at the just concluded fifth Annual General Meeting held in Benin City, Edo State, President of NACAN, Comrade Nkambo George, disclosed that it is difficult for some stations to read one another beyond 9am and 10am in some cases. According to Nkambo, the situation has led to the use of telephone lines, which ought to be the back-up, as the primary source. He said the southern network with the High Frequency (HF) radios deployed as a stopgap to assist HF, modulates from frequency to frequency and causes delay in messages as long as the network is bad. “We have resorted to telephones. We use this close user group telephone line, which ought to be the back-up. It’s more or less the major equipment we are using now in most communication centres, except for Lagos, Kano, Abuja and Port Harcourt where Alt is still functional. “Normally, messages are not supposed to be delayed; when you receive a message, it ought to go. The International Civil Aviation Organisation (ICAO) recommends that three minutes or at most five minutes as you receive a message, let it be sent out. So you receive backlog of messages in some centres as a result of equipment malfunction,” he said. He noted that in some centres, the radios were not functioning at all, stating that it is not good for the image of the association. However, on manpower, Nkambo commended the management of the Nigerian Airspace Management Agency (NAMA) for the transformation in the system through training of its personnel since Captain Fola Akinkuotu took over as the helmsman of the agency. Nkambo revealed that 40 of its members were undergoing training at the Nigerian College of Aviation in Zaria, while 16 graduated in August this year. He, however, said 28 members were yet to be trained. According to the NACAN boss, the non-employment into the department in the past two decades had negatively affected communicators and called on the government to commence the recruitment of between 20 and 50 personnel every year to fill the gap. He disclosed that 27 staff would be retiring in January next year, which he declared would also affect the department as the newly recruited personnel had no job experience. Meanwhile, the management of NAMA has said that the provision of relevant technology is important for professionals to perform their roles. Ayodele Otitolaye, who represented the Managing Director of NAMA at the event, gave the assurance that the management would continue to provide modern facilities required to perform the task of air navigational services. According to Otitolaye, the issue of inadequate manpower due to aging workforce is being addressed gradually across all sections of the agency.